Abstract. An incomplete financial market model is considered, where the dynamics of the assets price is described by an \(R^d\)-valued continuous semimartingale. 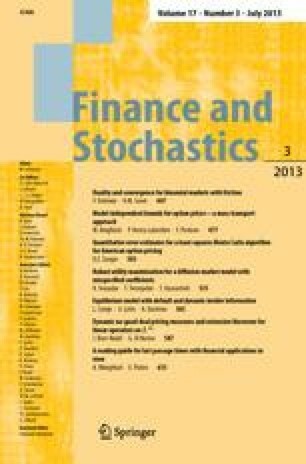 We express the density of the minimal entropy martingale measure in terms of the value process of the related optimization problem and show that this value process is determined as the unique solution of a semimartingale backward equation. We consider some extreme cases when this equation admits an explicit solution. Research supported by INTAS Grant 97-30204. The authors are grateful to an anonymous referee for valuable remarks and suggestions.